We Clarify and Reiterate the Driscoll’s Boycott is in Full Force as it was called for by us more than a year ago and has been supported by consumers in Mexico, the United States, and other parts of the world, by organizations, democratic unions, communities, and consumer groups. We extend our greatest recognition for the support provided thus far. San Quintín has shown that slavery in Mexico has never been abolished, we continue to see in the fields the same inhumane conditions, treatment, discrimination, and lack of protection for agricultural workers. Chemicals are still being used that contaminate the water and fruit that are harvested; to this point all Driscoll’s subsidiaries have refused to recognize the union’s representation (SINDJA) of farmworkers in San Quintín or to negotiate the signing of a collective bargaining agreement. According to some reports, the boycott is in question. Our stance continues to be the same. 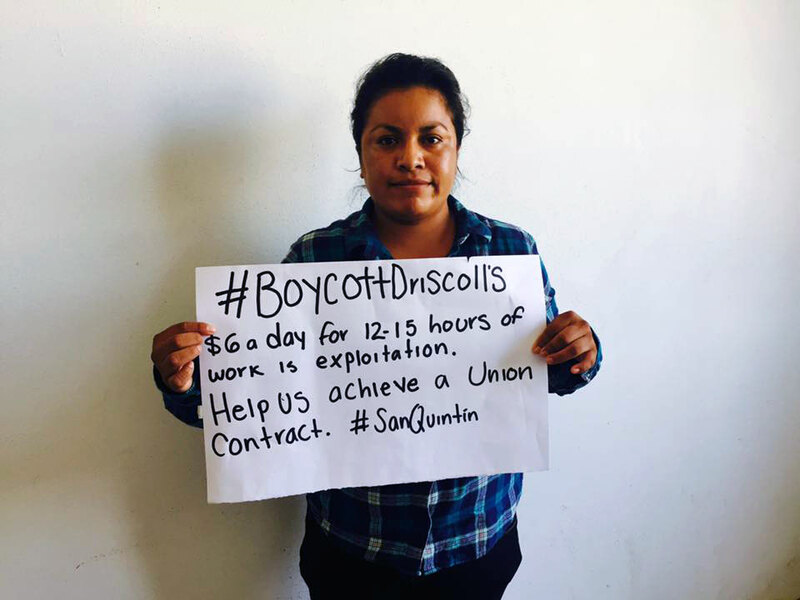 We strongly support the Driscoll’s Boycott for the benefit of the farmworkers in San Quintín. We are committed to continuing to promote the Driscoll’s Boycott, to expanding to more cities in Mexico and the United States in 2016 as agreed upon at the March of the Two Californias, and to continue reaching out to different spaces to raise the awareness of the millions of consumers around the world who buy Driscoll’s products. We will not shut down the organizational work that has cost us more than a year’s work. We will take the necessary time to continue pushing the boycott. We know it will take a long time, but we are convinced that we will succeed with the same pressure of millions of consumers. We will continue our resistance, boycotting Driscoll’s for the dignity of thousands of farmworkers that have supported the movement since March of last year, always in good faith, warmth, peace and towards a better life and a better future for farmworkers’ families in San Quintín. FOR A BETTER FUTURE AND A NEW COUNTRY! FOR A BETTER FUTURE AND A FAIR COUNTRY!